Nothing’s quite as good as that elusive new car smell. Unfortunately, it always seems to fade quickly and disappear entirely a year or so after you first pull out of the dealership parking lot. Once it’s gone, it never comes back. Even if you’re careful not to track dirt through your car and you never eat so much as a bite of a cheeseburger at a stoplight, your car interior will inevitably begin collecting debris with each passing week. Though a car vacuum can’t guarantee that new car smell will stick around forever, having a quality unit and using it often is one easy way to keep your car interior in a like-new condition. Not unlike a standard home vacuum, car vacuums are electrical cleaning appliances that remove dust and small particles from carpet and upholstery. Using a suctioning unit, vacuums can lift fine dirt out of hard-to-reach places in order to keep your car interior in like-new condition. 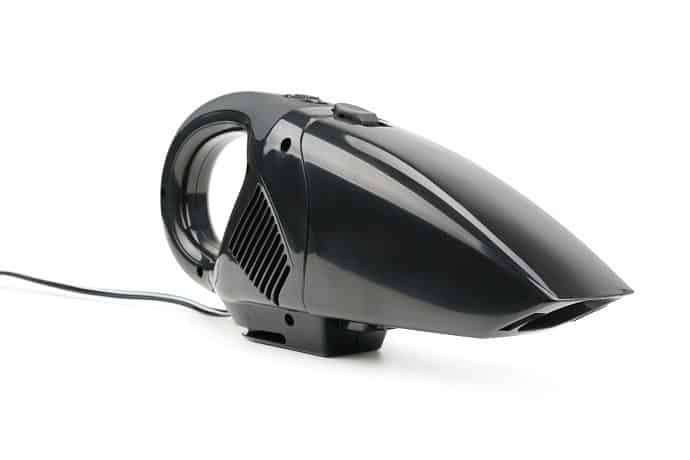 Car vacuums differ from standard home vacuums in their size and intended use. While home vacuums are generally larger units designed for covering large spaces at a quick pace, car vacuums are generally smaller, more maneuverable and designed with tight spots in mind. Although you can use a traditional vacuum inside an automobile, it’s often incredibly frustrating and considerably less efficient. Home vacuums are ideal for flooring types like interlocking tiles and all types of carpet. If you’re still debating on vinyl plank vs laminate flooring, the good news is that a home vacuum can tackle both. They’re just not as great at cleaning car interiors. If you choose to make do and attempt cleaning your automobile with your home vacuum, expect to wrestle with pesky cords and struggle with attachments that don’t quite reach. In contrast, car vacuums are smaller, often cordless, more effective and easy to use. If you’re not up for the unnecessary struggle of trying to cram your standard home vacuum into your car’s tight interior or you value your car and want to keep it clean, a car vacuum is definitely the way to go. If not maintained, a car’s interior will quickly gather stains and dirt. Besides being unsightly, gathered dirt also lowers an automobile’s overall value, which can cost you money if you ever plan to trade-in or sell. Because using a standard vacuum in your car’s interior is time-consuming and frustrating, it discourages owners from vacuuming frequently. However, the simplicity and ease that car-specific vacuums provide make interior car maintenance quick and easy. Allowing dust and other allergens to settle in your car’s interior may be affecting your health in ways you don’t perceive. Regularly vacuuming your car interior using a car vacuum can help to remove these allergens, which can help to strengthen your immune system and protect your body from illness. If you have children or pets, you’re no stranger to having to clean up impromptu messes. Without a quality, portable car vacuum, the M&Ms your little one spills on the floor will quickly melt into your upholstery, causing permanent damage. The same goes for the unsightly mess of body fluids your labrador might produce when struck with the nervousness of another vet visit. With a car vacuum, you’re able to clean up messes when they happen, which helps protect both your car and your sanity. 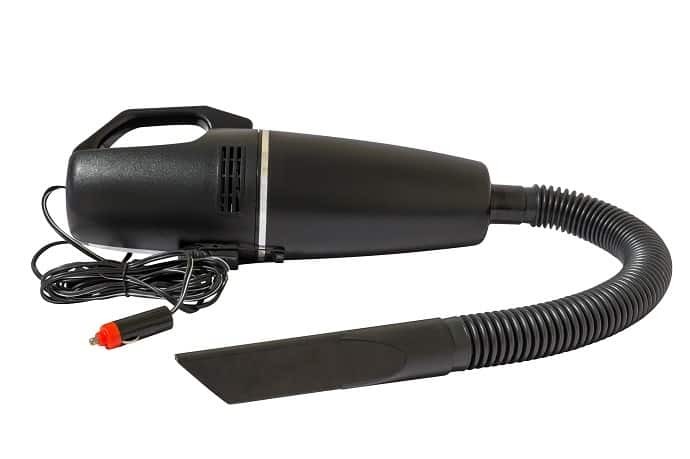 The method and efficiency of a car vacuum will vary mainly depending on the model type and unit brand. However, most car vacuums work by utilizing a motor to create a suction, which allows the device to remove dust and dirt. This makes them especially useful against pet hair, which is one of the most common types of mess seen in car interiors. Because pet hair clings to fabric and flooring, it’s nearly impossible to remove without a solid vacuum cleaner. Car vacuums are also useful in removing damp or wet particles that may otherwise sink into your upholstery and encourage the growth of mold. If you can already see mold or other hard stains in your carpet, however, it’s time to consult a steam cleaner or other more intensive cleaning unit. Because car vacuums rely on suctioning power to mostly remove dry and loose particles, they’re less effective in stain and mold removal. However, if you can catch a wet mess before it becomes a hard stain or mold, a vacuum can save the day and make sure permanent damage can’t happen. Car vacuums come in a wide range of shapes and sizes. Which one fits best into your life will depend on your own personal needs and how you plan to use the product. Handheld vacuums are compact, smaller units that eliminate the need for a hose. They usually feature a nozzle that’s shaped for reaching crevices. Handheld units are designed with portability in mind and are generally cordless or powered by your car’s cigarette lighter. Canister units have a two-part design that generally employs a canister-like body that contains the bag and motor paired with an extension hose. Because of its dual-design, canister units can incorporate heavier, more powerful units without compromising the vacuums maneuverability. The hose attachment allows the user to move the heavy canister minimally while still cleaning hard-to-reach spots. Shop vacs are the heavier-duty device option. They’re a popular choice among those who need to clean utility vehicles or rural trucks, but can be used by anyone seeking a product with a bit more power. Generally, the shop vac can clean small, dry dirt particles as well as wet messes. This sets it apart from its canister and handheld units, which tend to specialize in dry messes, pet hair and dust. The power of a vacuum is determined by its motor size. When it comes to car vacuums, a stronger motor generally means a higher potential for suctioning power, which leads to a more powerful product overall. However, stronger motors also consume way more energy. Products can range anywhere from around 15 watts to as much as over 1,000. Corded units will consistently have a higher wattage than their battery-operated rivals. Keep in mind that when reviewing motor powers in relation to watts, the product’s wattage refers only to how much energy the unit consumes, not the power of the motor or how well it necessarily vacuums. The vacuum power is especially important when shopping for a cordless unit, as more powerful vacuums will inevitably have longer charge times and shorter usage periods. A good selection of vacuum tools will help you tackle messes of all kinds, but additionally, accessories also make vacuums bulkier and more expensive. Attachments such as adjustable nozzles can eliminate the drama from cleaning your car’s tight spaces. Some simplified vacuums opt instead to integrate a crevice tool into the vacuum’s standard design, making for a more streamlined (but less versatile) product. 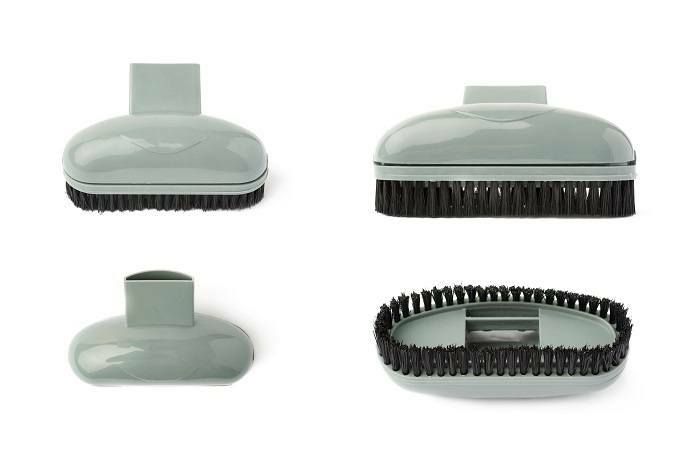 Additional helpful attachments may include a dust brush for your car’s more delicate parts. This is effective in removing dust from radio buttons, the center console and other more intricate areas. Suctioning power is one of the most important measurements of a vacuum cleaner’s efficacy. Often referred to as “water lift” or “vacuum,” suction describes the overall pull of air that the unit is able to take it. Suction is measured on a gauge in terms of “water lift” in inches. This refers to how high the suction can lift water. The higher the water lift, the more the suctioning power. It should be noted that to pick up debris such as pet hair, suctioning power is especially important. If you have a furry companion who you frequently allow into your passenger seat, investing in a car vacuum with a high-powered suctioning system is the best way to remove pesky pet hair. Filters come in all shapes and sizes from cartridge and cloth filters to foam and disc filters. Regardless of shape or appearance, most of the best vacuum units have a HEPA filtration system. By forcing air through a fine mesh trap, harmful particles like pollen, pet dander, dust mites and tobacco smoke can be removed before entering your lungs. With a HEPA filter, your vacuum isn’t just cleaning your seats and floor, it’s also purifying the air. Ideally, you’ll also want a reusable filter that’s easily cleanable, sturdy and ideal for long-term use. The unit’s weight will depend largely on the design and motor size of the vacuum. Most handheld and canister-style units will range from around 2 lbs upward. Their lightweight design is intended to be easier to maneuver and clean. Extra-powerful units (such as shop vacs) that have heavier motors due to their increased power output will generally weigh much more. The most portable models are battery-powered units that can be plugged in and charged or powered by an electrical outlet. If you decide to go with a highly-portable, rechargeable model, you’ll want to double check the product’s run time and charge time. Buyers should also beware that battery-operated units may lose their capacity to hold a charge after extended use, making them less efficient over time. If you’re seeking a higher-powered car vacuum for industrial vehicles or those with dirt-prone lifestyles, you may have to sacrifice portability for strength. Most high-functioning shop-vacs are corded, which sacrifices portability for overall power and effectiveness. Some models of high-power, heavy duty vacuums include water-lifting capabilities. While most lower-end car vacuums are intended for cereal, dirt, spilled food and other dry particles, a breed of vacuum called wet/dry vacuums are capable of cleaning up wet messes as well. What enables a unit to work as a wet vacuum is increased capacity and high suctioning power. Unfortunately, a bigger capacity usually means a heftier unit body, meaning you sacrifice portability for power. If you’re after a lightweight or cordless car vacuum and you plan on using it mostly for detailing and cleaning up those M&Ms your kid spilled in the back seat, you probably don’t need to invest in a wet/dry vacuum. If you own a utility vehicle or a van which you use for work purposes, you may think about investing in a heavier-duty wet/dry vacuum that can tackle all kinds of messes. Generally speaking, standard car vacuums can cost anywhere from around $30 to $70, although higher-end models can cost as much as $200 or more. If you’re working with a tight budget, the good news is that you still have options when it comes to shopping around for a car vacuum cleaner. In fact, some of the best vacuum cleaners are quite affordable. Lower-end models will usually be corded, with a less powerful motor and fewer accessories. If these small setbacks don’t phase you, it’s probably alright to move forward with purchasing a lower-end car vacuum. On the other hand, if you have the cash and you’re after a car vacuum that’s going to significantly improve your life and keep your upholstery spotless, you’ll be able to purchase a high-powered, cordless, lightweight model with a vast range of accessories. While the luxury of a higher-end model will inevitably simplify the cleaning process, not everyone can justify its price tag. Thankfully, there are also mid-range products that function well enough and won’t break the bank like the best vacuum cleaner under $100. While vacuum cleaners and automotive steam cleaners are both cleaning devices used for keeping your interior looking fresh and new, their end results and usage methods are quite different. Car vacuums are generally intended for cleaning up small dust and small debris like food crumbs, twigs, pet hair and bits of leaves. Vacuum units perform these functions by using their suctioning methods to remove particles. Steam cleaners, on the other hand, are some of the best carpet stain removers. They are intended for use after an area has already been vacuumed. While they’ll draw small particles into the unit through a suctioning system, they’re not designed to remove dirt on a large scale. Instead, steam cleaners are intended to be used as stain and spot removers. 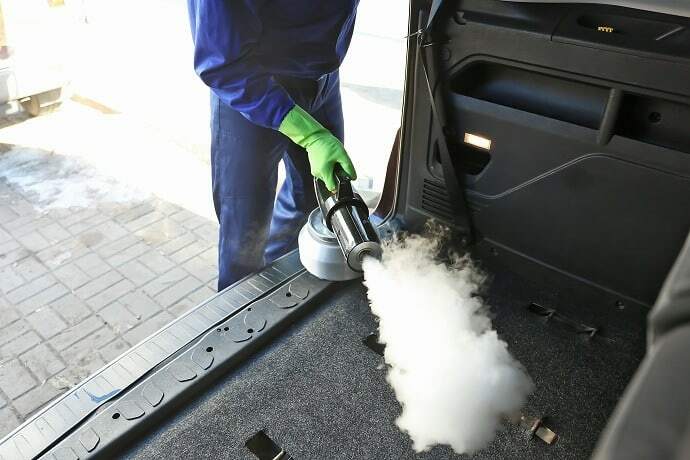 Much like steaming mops, steam cleaners use high-temperature liquid (as well as a pressurized system) to lift dirt and odors out of car interior. If you’re looking to detail your car and restore your interior to like-new condition, you’ll want to consider investing in the services of both a powerful vacuum and a steam cleaner. Operationally, car vacuums work much like standard vacuums. However, because they must be used to clean your car’s tight spaces, the method for using them effectively varies slightly. First, you’ll need to open all your car doors and take out any removable mats/ fixtures that may trap or hide debris. Especially if you plan on cleaning with chemicals, making sure there’s a steady airflow into your vehicle is key for cleaning safety. Before you begin vacuuming you’ll need to survey your car. Physically remove all large trash items or potential barriers to suction before you turn on your unit. Car vacuums are equipped to pick up dust, dirt and other small items. Larger or heavier debris should be removed by hand as to prevent clogs and jamming. Using the appropriate attachments, vacuum every inch of your vehicle (including underneath seats and floor mats). Like glitter, dirt gets everywhere. If permitted to set and settle into your interior, small particles can cause long term damage that lowers your car’s value and creates unsightly stains. Using a soft brush or other detailing attachment, dust the delicate parts of your car’s interior such as the radio, steering area and gear shift. The two most important aspects of cleaning and maintaining your car vacuum come down to the unit’s filtration system and bag. A vacuum bag system varies from one model to the next. Some appliances are bagless and come with a dust cup that’s easily cleaned and reused. Others have bags that’ll need to be periodically removed and replaced. Regardless of your vacuum bag system, making sure it’s never stuffed to the brim is the best way to maintain your unit’s suctioning power and prevent overheating. While filters also come in many shapes and sizes, it’s always essential to keep it clean. Clogged filters will lead to ineffective cleaning and potentially lower the unit’s suctioning powers. If the filter becomes especially dirty, the vacuum will actually begin spreading dust and debris rather than cleaning. Vacuum units designed will often come equipped with spinning brushes. This feature is intended to agitate dust and pet hair and make for a more effective vacuuming experience. With time, these bristles can become caked with dirt and hair, making them ineffective and unsanitary. To keep all parts of your car vacuum in top-shape, clean your vacuum bristles regularly with a toothbrush or other bristled cleaning device. Can I use my home vacuum in the car? While it’s definitely possible to use a home vacuum on the interior of your automobile, it might not always be ideal. Because home vacuums are designed for large, open spaces, they may be difficult to maneuver and use effectively in the tight spaces between seats and in crevices. 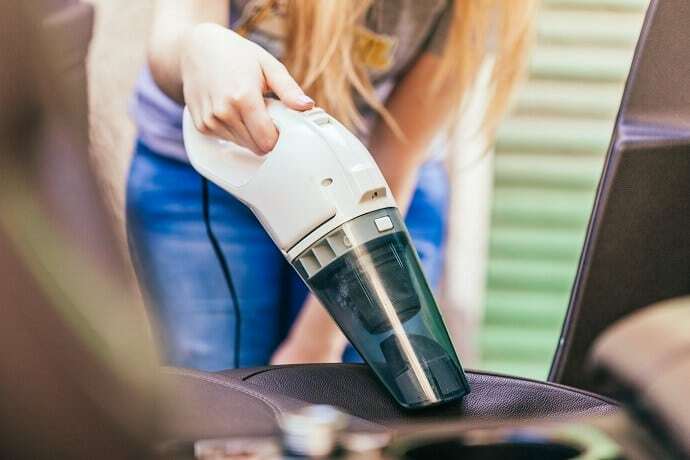 While some home vacuums may be equipped with special attachments that allow for use in tight spaces, a car vacuum will almost always perform better when it comes to cleaning your vehicle’s interior. Will car vacuums help to remove the odor? Whether or not your car vacuum will help to remove odor depends largely on what is causing the smell. 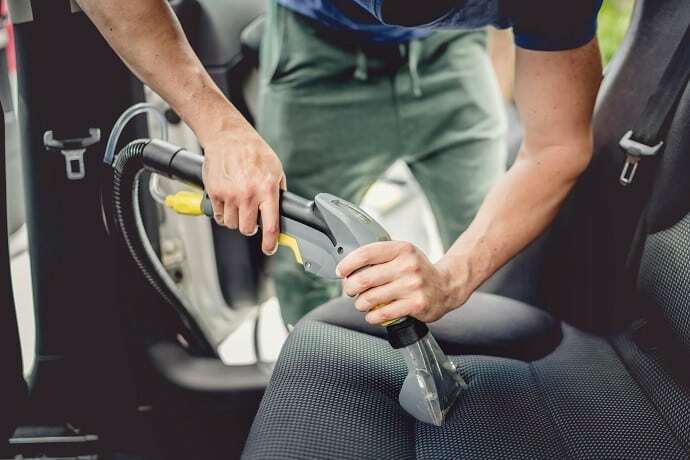 In many cases, vacuums are able to remove both wet and dry messes before they have the potential to become odorous, which helps keep your car interior looking and smelling great. For extra help removing odor from upholstery and floors, you may consider investing in a steam cleaner or other power-washing system. Especially if you have children or pets, investing in a quality car vacuum can help keep the messes in your life manageable. 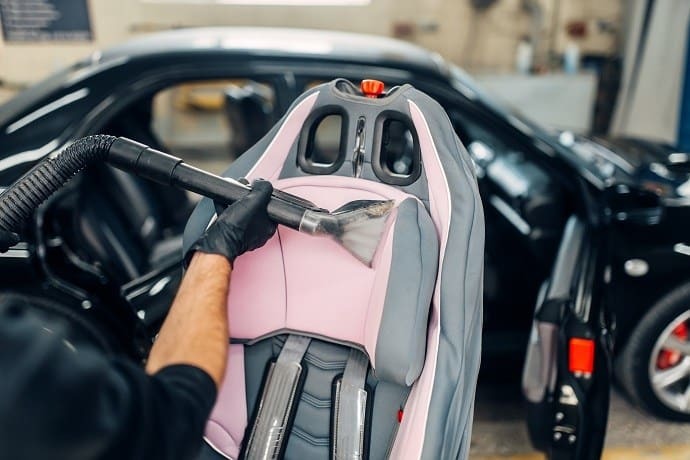 Besides simplifying your life and keeping your car clean and allergen-free, a good car vacuum will also keep your interior upholstery in like-new condition. Photos from: Fotofabrika / depositphotos.com, Nomadsoul1 / depositphotos.com, Serg 64 / depositphotos.com, exopixel / depositphotos.com, Sergiy1975 / depositphotos.com, belchonock / depositphotos.com and bogdan.hoda / depositphotos.com.